/* "maxPageIndex" gives one blank page if the module of the division is not zero. Very nice Work, thanks a lot. But i recognised an extreme CPU-usage when using your class on my system. and the same for the gray color. This is clearly an infinite repaint loop bug. Hmm, what OS and Java version are you using? So i need to iterate and copy to object.So if huge number of record is coming it will be a performance issue ??? And i need to apply pagination so were i have to change ?? I'm not sure of the problem, but how about to use a DefaultTableModel#addRow(Object) instead of "copy to object". BTW, what has become of LinkViewRadioButtonUI compilation error? When user click on the header whole model should get sorted not the view?? 1. "maxPageIndex" gives one blank page if the module of the division is not zero. Perfect! Thanks for the corrections, erServi. 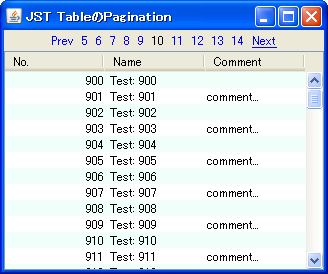 I am newbie in Swing, I like this pagination in JTable, my question please how to use it with from a resultset from a jdbc connection from a database or using hibernate ? This is what I wanted.. Thanks. Just only thing need to add is Page No ,Total pages and search according to page no(Example :: Page 1 out of 10 and when we type page no in Text Field it will redirect on that page). Thanks for guiding me.Now I am facing critical problem in JTable and need your help. Problem::If there are 50,000 or more rows in the table then it takes too much time to load.So how can I solve this problem and how can I show instant data in table with the same code on github.